LaChapell Audio is known worldwide for designing and building the some of the finest boutique microphone preamplifiers on the market. Digital Audio Labs is excited to continue that tradition. With a new line of products showing at NAMM, the coveted LaChapell Audio sound and technology will be more widely accessible. These products offer the same boutique sound that studios around the world rely upon at a price point that is within reach of every small and home studio. Getting a great take is all about having the right tools. The LaChapell Audio Dual Topology Preamp is “all the right tools.” With the solid state “side” fully engaged you will capture the source with maximum transparency. Switching to the tube side brings in the warmth and harmonics that only a Truetube™ powered vacuum tube can provide. The blend knob mixes the two topologies so you can favor the tube or solid state depending on your tracking needs. The tube section of this model is based on the highly popular LaChapell Audio 583S 500 series tube preamp. The LaChapell Audio Channel strip is the Swiss Army knife of 500 series modules. Each half of the two-bay module can function independently or in series so it’s like having multiple units in one. The first “bay” is dedicated to a pristine preamp with an integrated Hi-Z input. The second bay is the effects section with a mastering grade three band EQ and compressor followed by a trim or gain stage. Each section can be run in series, or bypassed completely for maximum flexibility. This unit shares some of the preamp/eq functionality of the LaChapell Audio 583E. 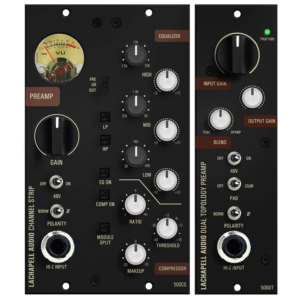 Both LaChapell Audio products will be available to demo at NAMM booth and will ship in late Winter, 2018.